Longboard champion Candice O’Donnell shares her top tips for budding surfers. 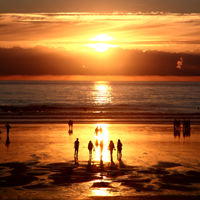 – No matter how you look at it, when you’re surfing you are working your body and mind consistently at all times. – Surfing is a high impact sport; therefore your general fitness plays a major role in determining how quickly you will progress. – Good stamina, flexibility, and core strength are areas I would advise you to work on most. Good stamina will allow you to last as longer in a session, and not fatigue to early on. Good flexibility will help in injury prevention and increase maneuverability and good core strength will maximise your surfing technique. – The fitter you are the faster you will progress. 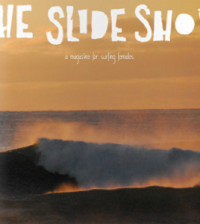 But the mind also plays a major part in surfing, so feed your mind and educate yourself. Build a good foundation of knowledge, confidence and self belief and you’ll go a long way. – A positive mental attitude is key. Become a strong swimmer; swimming in the surf is probably the next best exercise to actually going out surfing. Go on flat days when the surf is small, keeping your body ready and conditioned for the next swell. Take the time to study the ocean, immerse yourself in knowledge about the tides at your local beach, and learn how to paddle out without being dragged out in rips and currents. 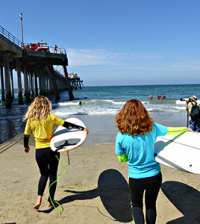 Watch and assess the conditions before you paddle out, sit and observe the waves. Tune into your equipment, and your surroundings. 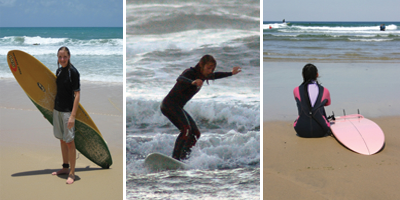 Try and find surf partners, who surf better than you and are happy to pass on tips and advice, book yourself a lesson at your local surf school suitable to your ability. Finding the right board is key. You never want to jump in at the deep end and buy yourself a board that is way too progressive for you, you’ll not only get very frustrated, but you’ll also never learn how to surf quickly. When you’re first starting off, the most important thing is getting a board that’s really stable-wide, long and thick. Be realistic and honest with yourself about your ability, there is no shame in starting on a foam board. Don’t put too much pressure on yourself to get to your feet straight away. Enjoy the sensation of gliding along with the wave, and get used to finding your balance on the board. Set yourself small achievable goals, and slowly work your way up to the next level. Reward yourself each time you successfully complete a goal, and work on what you might like to improve in your next session. Take constructive criticism, and enjoy the whole process. Respect the locals – Don’t drop in, don’t mouth off, watch and learn from the best in the line up, and have respect for the local people if you are surfing their home break. That way you’ll find you will actually get respect back and far more waves given to you. The pop up… practice the pop up every day. Start by practicing on the beach. Try and avoid popping up from the knees, this is a bad habit and its more difficult to get to your feet from a kneeling position. Try and do at least 5-10 pop ups on land before heading out. Remember to keep your knees bent, eyes looking forward, and your feet over the centre of the board (over the stringer). Remember to smile, it really makes a difference. Candice is going to be taking part in the Relentless Boardmasters festival from August 10-14. 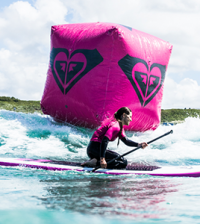 She told us: “For the first time ever this year at the Relentless Boardmasters there is finally a ladies LQS 3 Star event along side the men’s, and its on home turf, at my local break.